while kirin makes great milk tea (voted cows favourite milk tea after MOS', that is), this green tea version taste..... er...... surprisingly GREEN. It says "Lighten up your day with Pocky's super smooth aero-chocolate." (Whoever has the job of coming up with all the engrish on japanese confectionary boxes has the best job.) Best tasting pocky yet! 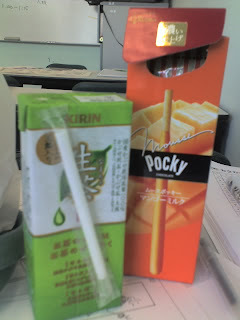 I'll be heading for the grape pocky next week! haha. your blog really is all about foooood. haha.